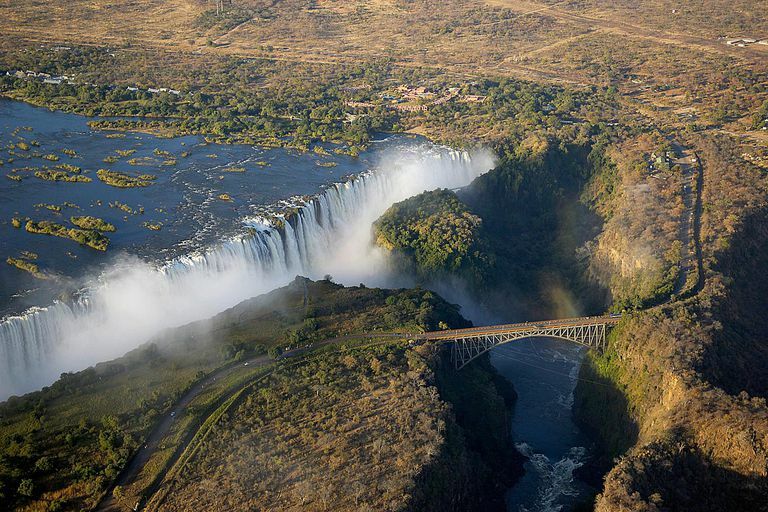 The bridge over the Zambezi River at Victoria Falls separates the countries of Zimbabwe and Zambia. The five themes of geography are location, place, human-environment interaction, movement, and region. 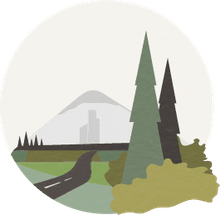 They were created in 1984 by the National Council for Geographic Education and the Association of American Geographers to facilitate and organize the teaching of geography in the K-12 classroom. While they have been supplanted by the National Geography Standards, they provide an effective organization of the teaching of geography. Most geographic studies begin with learning the location of places. Location can be absolute or relative. Absolute location—Provides a definite reference to locate a place. The reference can be latitude and longitude, a street address, or even the Township and Range system. For example, you might be located at 183 Main Street in Anytown, USA, or you might be positioned at 42.2542° N, 77.7906° W.
Relative location—Describes a place with respect to its environment and its connection to other places. As an example, a home might be located 1.3 miles from the Atlantic Ocean, .4 miles from the town's elementary school, and 32 miles from the nearest international airport. Place describes the human and physical characteristics of a location. Physical characteristics—Includes a description of such things as the mountains, rivers, beaches, topography, climate, and animal and plant life of a place. If a place is described as hot, sandy, fertile, or forested, these terms all paint a picture of the physical characteristics of the location. A topographical map is one tool used to illustrate the physical characteristics of a location. Human characteristics—Includes the human-designed cultural features of a place. These features include land use, architectural styles, forms of livelihood, religious practices, political systems, common foods, local folklore, means of transportation, and methods of communication. For example, a location could be described as a technologically advanced French-speaking democracy with a Catholic majority. This theme considers how humans adapt to and modify the environment. Humans shape the landscape through their interaction with the land; this has both positive and negative effects on the environment. As an example of the human-environment interaction, think about how people living in cold climates have often mined coal or drilled for natural gas in order to heat their homes. Another example would be the massive landfill projects in Boston conducted in the 18th and 19th centuries to expand habitable areas and improve transportation. Humans move, a lot! In addition, ideas, fads, goods, resources, and communication all travel distances. This theme studies movement and migration across the planet. The emigration of Syrians during war, the flow of a water in the Gulf Stream, and the expansion of cell phone reception around the planet are all examples of movement. Formal regions are those that are designated by official boundaries, such as cities, states, counties, and countries. For the most part, they are clearly indicated and publicly known. Functional regions are defined by their connections. For example, the circulation area for a major city area is the functional region of that paper. Vernacular regions are perceived regions, such as "The South," "The Midwest," or the "Middle East"; they have no formal boundaries but are understood in our mental maps of the world.